Joey Fucknuts, known to his friends and loved ones as Joey Steelwings, stared out the cockpit window of the airplane he had built with his own two fists. Since reaching cruising altitude (or what he assumed was something that at least approximated cruising altitude as his altimeter read only “ON THE GROUND” and “REALLY HIGH UP”), both Joey's aircraft and his mind had been on autopilot. He had a hard time accepting that he had managed to get into the sky. His brain, already on the frayed and overheating side simply because of who and what he was, was going haywire. Once he had released his somewhat terrified grip on the controls and was confident the autopilot was not going to immediately reunite him with the ground in a spectacular and impactful way, he had simply stared, struck numb. Then, he cried for about an hour, not sure if he was supposed to be allowed to feel such powerful happiness and awe. Then he got distracted trying to figure out whether he had actually died in the attempt and this was just what happened after someone died. Then he decided that he was probably still alive and cried some more, unable to entirely accept that of all the people, he was the one that got to have this life. But then there were the clouds. This was very important. This was why he had come here. Some observations had to be made. It was time to learn. Joey got out his spiral notebook and pen and narrowed his eyes at the white things in the middle distance. He still didn't trust them completely, but was willing to give them the benefit of the doubt. He let the autopilot keep its collision course, curious to see if the cloud would either attack (in which case Joey would have some emergency repairs to do in very short order, he was sure) or move out of the way, which he assumed would only be natural and polite of a thing to do. He flew dead on. The cloud did not move an inch. But it was getting bigger. This confused Joey enormously. It wasn't changing its shape, and it wasn't moving. But it was rapidly becoming huge. Extremely, ridiculously huge. And it had brought friends. And none of them were moving. It was just a wall of white. They were ganging up on him. They wanted to stop him. He knew they would try something like this. He knew they were going to be trouble, right from the start. Joey set down his notebook. He snorted, and frowned in determination. No cloud magic was going to scare him off. No way. He'd sacrificed too much, he'd worked too hard. The clouds were going to have to be nice and learn to share the sky with him. If they pulled some trick, and this was how his journey ended, then Joey would just fix himself and fly once more. He'd done it once and he could just keep doing it, again and again. He'd show the clouds that he wasn't going to be scared, and he wasn't going to turn back. Not anymore. The clouds were very, very large now. He could see no blue. It was all white. Joey lowered his goggles, bared his teeth, and growled his defiance. He stayed his course. And then the cloud was all around him. Joey opened his eyes. All the windows, front, left, and right, were completely whited out. He blinked a few times to make sure his eyes were still working. Apparently, they were. Either the cloud had eaten him, or clouds were not what he thought they were at all. 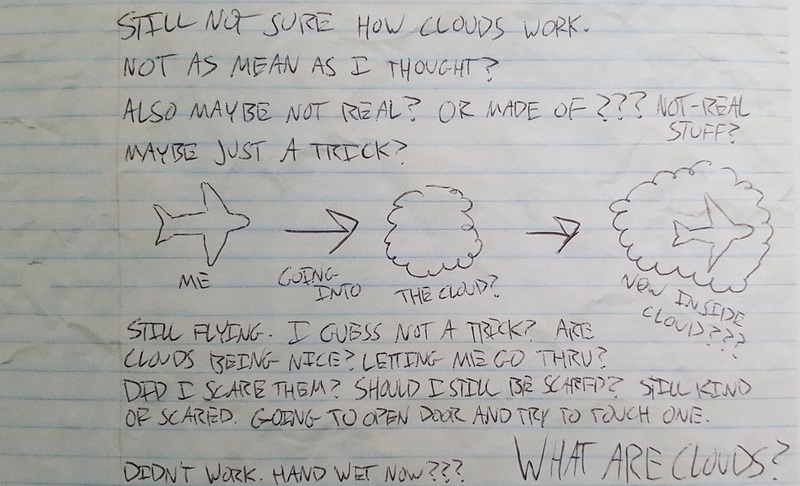 After waiting a few moments to make absolutely sure he wasn't going to be smashed out of the sky by an angry white fist, he pushed his goggles back up and grabbed his notebook, looking back up at the windows and down at the paper in rapid succession as he furiously scribbled. There were a lot of things to learn right now. Hours later, Joey is staring not at clouds, but at a tree. He had only ever seen trees in pictures before. That was how he knew they were called “trees”. Joey was surrounded by them. There were so many that he literally could not count them. He had tried for about 45 minutes but had run out of numbers. So he gave up, and simply stared at one, trying to figure out what it was made of. Landing had been a strange experience. Joey had never landed an airplane, but he had seen all the trees from up in the air and wagered that it would have been a terrible idea to try to land on top of them. So he flew around for a little while until he had found a wide clearing, then touched down in the grass, while gritting his teeth and hoping that the fat tires he'd put on the landing gear would hold up against all the tangly grass. He'd bumped up against the wall of trees a little bit, but hammered out the dents and judged that he'd done a pretty good job, all things considered. The sun was going down. He had flown all day. And he had no idea where he was. The trees were nice, though. It was very kind of someone, whoever they were, to put all these carvings out here. He inspected them happily, appreciating the craftsmanship that had gone into them. He couldn't even see the seams where they had glued the branches on. After a while, he went into the plane and got out something to smoke. He decided on cigars, because this was a special occasion. It was time to celebrate. He lit two with a blowtorch, and sat down on the bomb bay door, looking out at the wide grassy clearing that now had some stripes on it where he had made contact with the ground. It was very pretty. The sun was touching the tops of the trees, and it leaked out purples and pinks and oranges where it made contact. Joey thought it was very silly of the sun to try to touch something that was obviously pretty sharp. He smoked, and looked, and tried not to think about how he was going to take off again. Joey thought about where he was. He didn't know if it had a name. It was possible, he guessed, that he was the first person to ever come here. He didn't see anyone else around. No people, no buildings. There were a couple birds. He had seen a little horse with spikes growing out of its head, which was really metal. He tried to talk to it, but it ran away, probably because an animal with spikes growing out of its head was too awesome to hang around and talk to a guy like Joey. Joey understood that. If Joey had spikes growing out of his head, he'd probably have a really different perspective on things. He decided to name this place Treeland. He figured that made the most sense. Trees seemed to be the main thing around here, and it felt good to honor whoever had worked so hard to make them all. He wondered where they were now. He'd like to shake their hand and thank them for their beautiful work. Before long, it got dark. Treeland started to get noisy. There was a loud sound all around, almost like an alarm. But it didn't sound afraid or panicked – it was a rhythmic, happy sound. He wondered if the tree guy had built speakers into the trees, and they were playing music. It wasn't very metal, but he liked it anyway. Joey decided that he liked this place very much, and when it got light again, he would get on his motorcycle and ride around some, and see how far the trees really went. The music stopped. Birds flew out of the trees in droves. Treeland fell quiet. It was a rhythm. Loud and hard enough to shake the ground. Joey took his cigars out of his mouth and waved the smoke away. He glared out at the clearing, toward the other wall of trees. The sound was coming from over there. He didn't like it. He didn't like that whatever it was was scaring Treeland into silence. It felt wrong. Joey put his smokes out and went into the hangar. He picked up one of his flamethrower axes from the rack, as long as he was tall, and checked its fuel canister. Checked its edge. He hefted its great weight over his shoulder and stepped out onto the grass, looking. Scanning. Then there was the sound of cracking, splintering. He saw, on the far end of the wide open space, trees being knocked down. Pushed aside like matchsticks. Whatever it was wasn't moving quickly, but it was moving heavily. And powerfully. The tree wall bowed, and something huge entered the grassy space under the dark starry sky. There was enough light to see by. Joey's eyes worked well in the dark, he was sure that he would be able to see anything that was there, especially anything that big. And it was there, and it was big. But he still couldn't see it. It resisted his glare like water sliding off a waxed windshield. A shifting, twisting shape, only barely there. Hulking. Massive. A hint of a long head, a snout. The suggestion of four legs, the insinuation of a tail. But no details. Nothing that his eyes could firmly grasp. It was a beast made out of wind and whispers, that faded and danced just out of sight like the shadow of a candleflame. And it was ruining the trees. Joey took exception to this. Someone had worked very very hard on all these trees, and this thing was walking through them, shoving them over like they were garbage. It was disrespectful. The Mayor of Vulture Gulch opened some valves and lit the pilot light on his enormous flamethrower, then marched toward the colossal thing, frowning and determined to give it a piece of his mind. Joey stopped walking. The earth beneath his boots rumbled with the force of the thing's voice. There were no words. Just intent. Its head, the size of a car, was aimed directly toward him. It split. There was a long glint. Something, or a lot of sharp somethings, shone in the starlight. It walked forward, only barely there, almost impossible to truly see. But its footfalls were real. Its growl was real. And Joey had a feeling that its teeth were real too. The thing didn't stop. With its great size, it was closing the distance fast, even though its pace was gradual, calculating. Hungry. It was very close now. It loomed over him. It was as high as a building. Joey could see the sky and the stars right through its gigantic body, and could see where its huge paws and long claws made craters and slashes where it stepped. The growl was as loud as a jet engine. Joey aimed the barrels of his weapon at it. It was so close. It came closer. Joey could feel heat. See lights where its great eyes should have been. The colossal jaws opened wide, and inside Joey could see only darkness. There was a great roar. The three barrels of the weapon exploded with righteous flame, casting a stream of eager and glorious liquid fire directly into the creature's mouth. Molten light bloomed in a furious corona all around, lighting up the dark forest. Joey leapt to one side as the great jaws came crashing down, taking a massive bite out of the earth where Joey had been standing an instant before. He rolled away, then found his balance and stood, frantically spraying the beast's flank with vicious flames before it could turn. The fire burned in great swathes upon the thing's unseen skin, but there was no reaction. It swiped a long shadowy leg with the speed of thunder, and it crashed into Joey like a hurricane made solid. He catapulted through the air for yards and yards, then slammed into the ground and slid through mud and wet grass, tumbling uselessly. He could feel enormous footfalls. It was coming after him. Joey plunged a hand into the mud to stop his slide, scrambled to his feet and flipped his grip on his weapon, holding it by the long barrels. The Mayor was not going down without a fight. He swung the brutally heavy axe like a baseball bat, and sunk it directly into the thing's nose as it crashed into him. Savage jaws clamped down on his entire torso, sending lines of white-hot pain driving from his collarbone to his hip. The creature shook him in his jaws with the speed and cruelty that a cat shows a captured mouse, then flung him away into the air. Joey tumbled once more, and smashed into the soft earth, a small heap of skin and bones far away. Joey had not felt pain in a very long time. His vision blurred. He tried to move, but couldn't. He could feel his axe in his hand, but couldn't use it. He couldn't use anything. The wolf made of death pounded over to him. Joey felt a horrible, crushing agony as it stepped on his back and legs. Joey could hear his spine creaking, being torn out of him. But it didn't give. He spiraled through the torture. He prayed that it would be over soon, that it would stop, that he would be torn and half and die so he wouldn't have to feel himself anymore. But he did not die, and he did not tear. The titanic animal lifted its paw, and threw him again. Joey was aware of a sensation of falling, but not much more than that. His life was darkness now, and his only memory was one of a distant pain. The falling stopped. He could feel cool dew on his cheek, and some blades of grass tickled him, asking him what was wrong. Joey knew what was wrong. He had decided to go out into the world. He made the choice. He flew away from where he belonged, and this was what he got. For his foolishness, for his presumption, for his willingness to abandon the people that cared for him most, he would be devoured. Consumed by a creature outside of perception, that felt no flame and no blade. This is how his quest would end. Trampled in the mud, as pointless as it, and his entire life, had ever been. And he would not see his friends ever again. He would not be able to make any more friends. He wouldn't get to bring the stories back, to make the people he loved happy. He wouldn't be able to help them anymore. Joey was what was wrong. And because of that, his family would be left in the dark, forever. They would live on, unaware of anything. They would work, for years, until eventually they realized he would not be returning. They would wonder whatever happened to their Mayor, the nice guy that helped them read the words. Maybe they would cry, maybe they would mourn for a time. But they would forget him. They would never live up to their potential. They would never live in the sunlight, and become who they were truly meant to be. Heavy footsteps, coming closer. Hungry death came on legs of shadow. Joey stirred. He writhed as a fresh wave of hateful pain coursed through his body. A hot wind blew over him, from the lungs of a cruel force. Something happened deep inside the small, stupid Mayor. Something became real. A realization. A wave of something undeniable. The pain became meaningless. His breaking body became a triviality. His spilled blood unfurled upon the ground as a banner, something declarative. His mind snapped back into place. He felt the love he had for his friends as a rushing river of molten steel, coursing through his dead flesh. He remembered himself. And he remembered what he was supposed to do, his sacred purpose, the reason he had been placed upon this strange and beautiful world. I WILL BRING THEM THE LIGHT! He smashed the ground and rose to his feet, liquid fire flowing from each and every puncture the beast had dealt him, the blood within his body burning with inner fury. His fists became wreathed in whirling, vengeful incandescence, the flames rising higher and higher until his arms were pillars of heat. His eyes, sunken and dumb, sparked and ignited into twin embers that looked with blind hate at the thing that bore down upon him. His body became a seething pyre, throwing wild shadows throughout the glade and casting everything around in a warm glow. The light from inside flowed outward as an inferno. As the shadowed behemoth fell upon him, he wound back and threw a punch into its nose, bellowing his unshackled rage. The detonation shattered the air, incinerating everything in a terrible nova of heat and light. A small sun that lived only for an instant and consumed and destroyed everything it touched. The ground buckled. The sky shrieked. And Joey Steelwings made himself real. All was still and quiet, save for the flames that burned for yards in all directions. Where the creature had been, there was only a crater, full of blackened earth. Joey's flames went out, leaving behind the husk of a dead man. He swayed, and bled. He looked for just a moment, to make sure that he had made his point, and saw that he had. He tottered unsteadily toward his airplane, but didn't make it. He fell to the ground just before the bomb bay door, smoke curling from his burnt clothes and skin.